Image chosen due to pure awesomeness.Legendary Pokemon. The mythical gods of the Pokemon world. My favorite topic. Oh, we're going to have some fun today. Legendary Pokemon are, of course, the poster children of the games, dating back to Gold and Silver with Ho-oh and Lugia. We've seen diferrent themes in how the legendaries were handled over the years. In gen 1, the birds were really just treated as bonuses, with little to no explination, and Mewtwo is explained only through optional reading in Pokemon Mansion. Gen 2 gave us a little more, giving us backstory to the beast trio and Lugia and Ho-oh. Gen 3's legendaries are considered very residential to their region, the main trio holding ties to its creation. Similar in gen 4, Dialga, Palkia and Giratina are considered as much more omnipotent, due to the magnification and scope of their powers. The other legendaries are revered in the same way. Generation 5 is diferrent, because the legendary Pokemon here are thought of a little differently. They are not thought of as gods, but rather as familiars, just with greater powers than most other Pokemon. This is meant to reflect the message of harmony and coexistence seen throughout Black and White, through the interactions between legendary Pokemon and people in Unova's history. The Musketeer trio protected humans from disaster in olden times, and the story of the heroes of Unova tells of humans and Pokemon joining forces to imrpove the world. However you view our favorite ultra ball targets, they still make for great discussion. And so I give you the legendary Pokemon Unova has to offer. And just a note, the only event legendary we'll be discussing is Keledo, due to his ties to the Musketeer trio. I'm saving the other two for another article. I'm not a huge fan of Victini. I think it's a fine idea, a sort of avatar diety for the concept of victory, the muse of winning(making it Charlie Sheen's favorite Pokemon), but I think the design is awfully silly, which marks it down significantly in my book. But you aren't here for my opinion, are you? I hope not, because if you are, you'll be pretty dissapointed unless I find more stuff to complain about. Ah, here's a favorite. You may be wondering why I'm referring to this trio as a quartet, with Keledo in there, so let me explain. The main trio here is Cobalion, Terrakion, and Virizion, based off the three musketeers, from Alexandre Dumas' classic tale. Cobalion, treated as the leader of the trio, is based on Athos, the de' facto leader of the group. He is considerably older than the others, and is treated as a sort of father figure to them, especially Keledo's basis, which we'll talk about in a minute, who he regards as a son. Virizion is based on Aramis, the most feminine and romantic of the group, explaining Virizion' s more feminine design. Terrakion is meant to be Porthos, the strongest and heaviest of the group. Keledo, considered part of this quartet due to its typing and movepool, would be based on D'artagnan, a much younger and more recent addition to the group. Talking physically, Cobalion is based on the Markhor, which is probably the coolest-looking goat in existence, or a kind of antelope, possibly the Greater Kudu or Common Eland. Virizion is based on the Gerenuk, a long-necked antelope with the same head and body structure as Virizion(just less flamboyant). Terrakion is based on oxen, as evident by it's horns, and also shares some traits with bulldogs. Keledo is based on the Kelpie, a supernatural water horse from Celtic folklore believed to haunt Scotland and Ireland's rivers and lochs, as well as a unicorn. Within Pokemon's mythology, the main trio of these four were guardians of humanity. One tale tells of a forest that was on fire, trapping many people. The three worked together to free the humans and put out the fire. Later on, however, the three observed how violent humanity could be, and gave up on them, hiding deep within caves and forests. Thundurus, Tornadus, and Landlorus are all based on kami, gods, of Japanese mythology. Thundurus is based on Raijin, god of thunderstorms(if you remember, Raikou was also based on this guy), and Tornadus is based on Fujin, god of windstorms. Raijin and Fujin are often depicted tigether, causing mischief in the skies, hence their equal reputations in Pokemon as troublemaking spirits. Landlorus is based on Inari Okami, god of fertility, abundance, and foxes(not clear on where that fits in). As far as I've found, there isn't much close connection between Inari Okami and Raijin and Fujin, but my guess is that Landlorus' standing as higher being over Thundurus and Tornadus comes from the concept of the earth's endurance through wind and rain, similar to Rayquaza's standing with Groudon and Kyogre. Physically, Tornadus and Thundurus are based purely on their god bases, resembing humans in body shape, with clouds for torsos similar to the common depiction of Japanese gods riding clouds. Their tails are based on tools Raijin and Fujin used to cause chaos. Fujin held a large bag of winds, which he would hold in both hands with the length of it flowing out behind him. Raijin carried a ring of drums on his back, to drum on to create thunder(these were changed to spikes in the games, for the sake of threateningness). Landlorus isn't really physically based on his god basis, which is usually portrayed as a human, but instead holds similar design to the other two of his trio. Here's a trio I wish we knew more about. Reshiram and Zekrom's creation story is directly tied into the plot of Balck and White, but Kyurem is, annoyingly, seemingly completely unrelated as of yet. The eventual Grey version will, hopefully, shed light on this. Reshiram and Zekrom's story should be familiar to you if you've completed the game. The two were originally one Pokemon, which worked alongside two brothers to create Unova. However, the brothers began to feud, seeking different things out of life. The younger brother sought ideals, while the older sought truth, and so the Pokemon split itself into Reshiram and Zekrom, each siding with one of the brothers. The two were equally matched in strength, and so the brothers set aside their differences, declaring there was no right side. 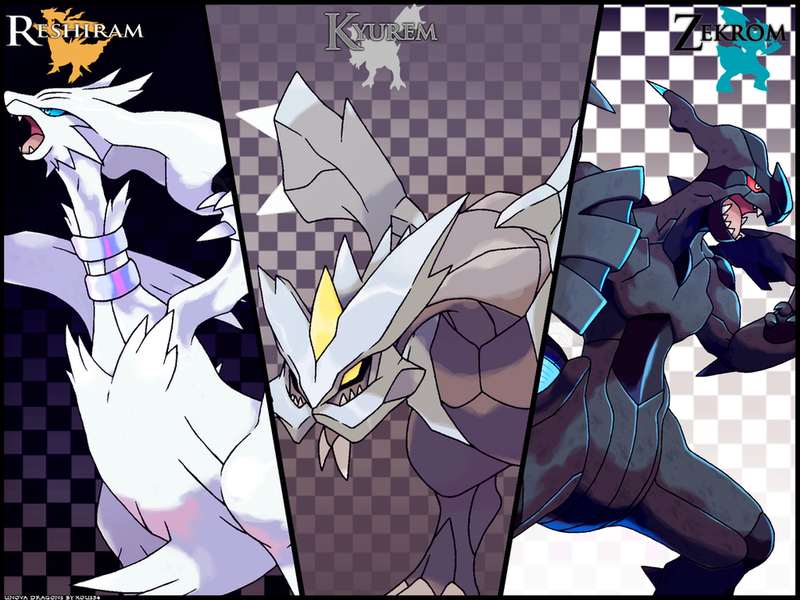 However, the battle was continued by their children later, and Reshiram and Zekrom's battles ravaged the region. After this point, the two went into hibernation, becoming the light and dark stones. Kyurem's mythology is completely unrelated to Reshiram and Zekrom. In Lacunosa town's folklore, it is said that Kyurem fell down inside a giant icy meteor, creating the giant chasm near Lacunosa town. It is said that Kyurem would come into the town at night to steal away people and eat them, which is why the town is surrounded by a large wall and all the citizens stay inside at night. One popular theory about Kyurem is that it is actually the corpse of the Pokemon that was once Reshiram and Zekrom. Wether there is any truth to this remains to be seen. 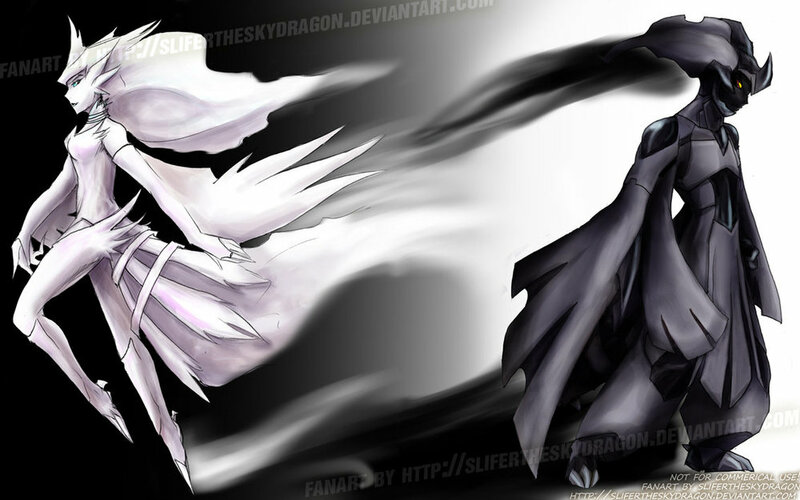 Reshiram and Zekrom are, of course, based on the Tao concept of yin and yang, black and white, opposing forces. Kyurem serves as wuji, the absence of good or evil. This is reflected in Kyurem's typing, ice, in relation to the concept of absolute zero. Reshiram's appearance is more light and ladylike, contrasting with Zekrom's tough, masculine appearence, while Kyurem remains more neutral. Reshiram's tail, the main feature of its design, is based on an engine or blowtorch, while Zekrom's is based on an electric turbine. Physically, Reshiram is based on a mix of animals, sharing traits with birds and canines, including wolves, jackals, and dogs. It also appears similar to the Wyvern dragon, adding feathers to the classic design. Zekrom appears to be more based on dinosaurs, spesifically the Allosaurus, as well as the classic European dragon. Kyurem appears based on the European dragon as well, in addition to the Theropod family of dinosaurs. Legendary Pokemon are awesome. The mythology behind them and what they mean is always fun to visit. Next time on Concept Corner, however, we're not coming back to that. In the final Monochrome article, we'll talk about the new Pokemon getting the most attention right now; those that are heading the list of awesome, the most popular competitive Pokemon of generation V. Stay tuned.